The Abandoned Newsham Park Hospital and Orphanage in Liverpool Merseyside is the venue that you have all been waiting for! Dusk Till Dawn Events bring you this extreme and terrifying location that is sure to tick all the boxes for avid ghost hunters and anyone looking for the ultimate fear factor experience! This vast grade 11 listed Victorian building which was built in 1870 and designed by Alfred Waterhouse; who also designed the Manchester Town Hall and the Natural History Museum in London lies on 3.5 acres of private fenced off land and has an interior size of 99,000 sq ft. It is set overlooking 200 acres of parkland and a large lake and has to be one of most terrifying places we have ever visited. Now derelict this locations historical background is that of an Orphanage, a Hospital and in later life an Old Person’s Nursing Home. This building is massive in size with so many spooky Corridors, Dens and Rooms to get lost in. On the upper floors of the building the old Hospital Wards can be found along with a Bell Tower, Chapel, eerie Staircase’s and the all time ultimate; the Mortuary with fridges still intact! This building has lain dormant and desolate for many years and much of the paranormal activity that is said to have occurred has been reported by security staff whilst patrolling the location. Whispering echoing voices are said to have been heard along with dark shadowed figures which have been seen fleeing up the stairs and corridors; as if eager not to be seen by onlookers. Strangely Workmen have also reported that tools that they had been using; were moved without explanation only to find them in other parts of the building. 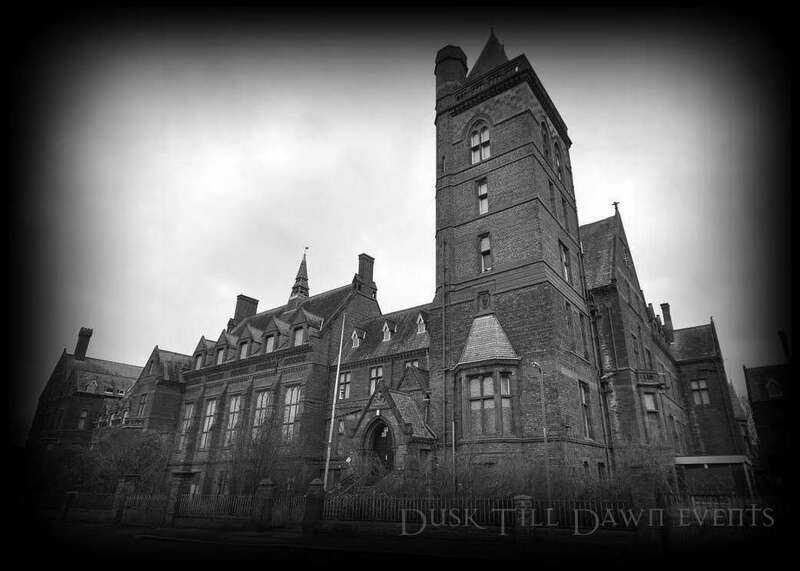 The Abandoned Newsham Park Hospital and Orphanage has an intense and foreboding atmosphere which hits you upon entering the venue; we know that you will not want to miss the opportunity to investigate this amazing horror movie style location. A terrifying place of sorrow, fear and much emotion who knows what will happen during the night when you join us from Dusk Till Dawn! If you choose the non-refundable deposit option, the final payment for this event will be required no later than the 26th September 2019. We accept a non refundable deposit of £15.00 per person for our Ghost Hunting Events that are 6 or more weeks away. *If paying by Deposit please note the final payment for this event will be required no later than the 26th September 2019. Please be aware that due to the derelict condition and vast coverage of the building this night will not be suitable for those with mobility issues. Please Note: This event may or may not include a guest Medium(s) or any history tour of the building.